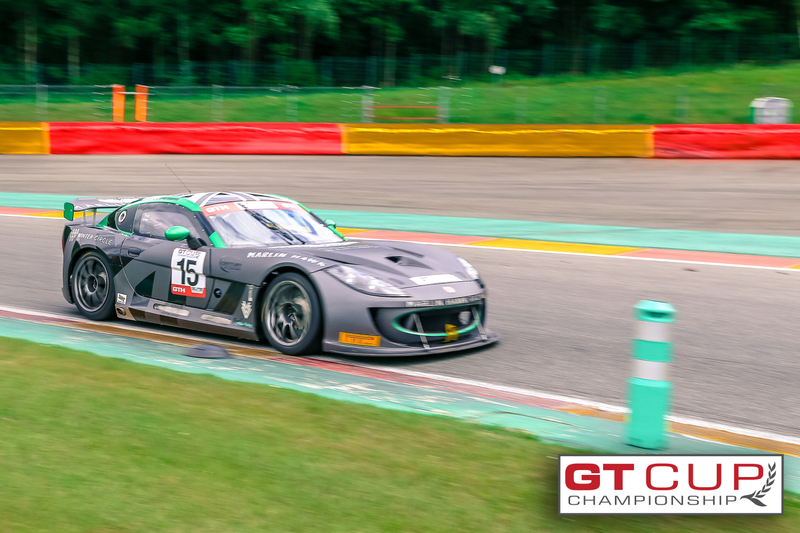 Coming away from the previous round of GT Cup with three trophies, David Holloway headed to Spa-Francorchamps with Century Motorsport on 2nd – 3rd June, hoping to add some more to his collection and he did just that! Hol loway is sharing the car with two of his good friends Piers Johnson and Phil Ingram throughout the 2018 season. Spa marked Ingram’s first outing of the season with Holloway. Friday morning saw a thunderstorm with heavy rain hit the Belgium-based track, causing floods in the surrounding areas. Both drivers managed to get a few decent laps in during the test and practice sessions on the soaking wet track. Saturday morning, the qualifying session got underway in much drier conditions. Despite not getting the most valuable track time on Friday due to the adverse weather, both drivers posted excellent times and ended up claiming pole position. Saturday afternoon, Race 1 got underway. Holloway was out first in the Marlin Hawk Racing styled car. By the second lap, Holloway had fallen back into second place and he was putting in some good laps in a battle to get his lead back until his stint was over but he remaned in second place when he handed the car over to his teammate Ingram. After an excellent win at Brands Hatch, the number 15 car had to remain in the pits for an extra 30-seconds due to the success penalty. After an agonising wait in the pits, Ingram got the G55 back into the race with a great opening lap however it wasn’t looking likely that he would catch up with the race leader as he would have around a 40-second deficit to somehow make up in just six laps by the time the race leader had exited the pits, after their driver change. Astonishingly, by lap 15, Ingram had halved the 40-second deficit and then by lap 17, he posted his fastest lap time of 2m37.875s which put him only five seconds away from the number 22 car in front. After a superb stint, Ingram crossed the line at the chequered flag just one-tenth of a second behind the winner, claiming a trophy for second place. Sunday morning, in dry sunny conditions, Race 2 got underway. Ingram was out first, starting the race from pole in class. He controlled the race well until lap 11 when the second place car overtook him and then Ingram took to the pits to allow Holloway to complete the race. Holloway drove really well in his stint and ended up taking the lead and eventually crossed the line in first position in class, achieving another winner’s trophy to add to his collection, which seems to be growing at a fast rate this season!